Let’s see…BSc in Chemistry (back in the days when it was called Alchemy!) 3 years a chemist for British Sugar, BA in English Mediaeval Studies, 20 years doing conservation and science at Historic Royal Palaces, 8 years trying to do management at The Bodleian Libraries, and 3 years setting up Heritage science in the library. What’s your role at the Bodleian? My boss was recently promoted (deservedly) to deputy librarian so waiting to hear who my new boss will be. But I work with all sorts of people who share a need and a passion for the work I do. Over the last year I’ve been successful in getting funding from The Leverhulme Trust for a research project to investigate some absolutely beautiful botanical watercolours, and I also got funding to purchase a hyperspectral imaging system, plus funding for a DPhil student to study the use of the equipment. I work with conservators, curators, academics, scientists, imaging professionals, IT professionals, resource discovery staff and readers (and probably folk who don’t fall into these categories). 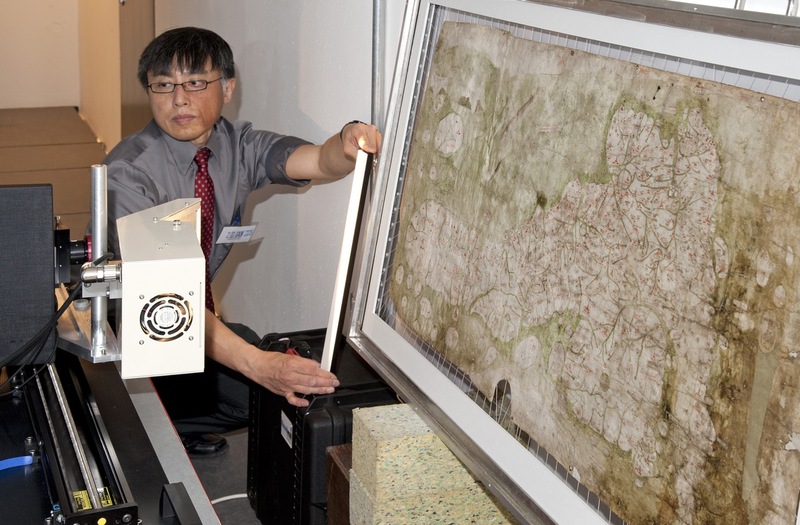 I have a public web page and conservation research strategy http://www.bodleian.ox.ac.uk/our-work/conservation-research and part of my mission is to promote heritage science. I’m having great fun with Prof Andrew Beeby from Durham University at the moment working with Raman spectroscopy. What’s been the most exciting or challenging thing you’ve worked on recently? This is a good time to ask me because the last week of February was one of the most exciting and rewarding times of my entire career! 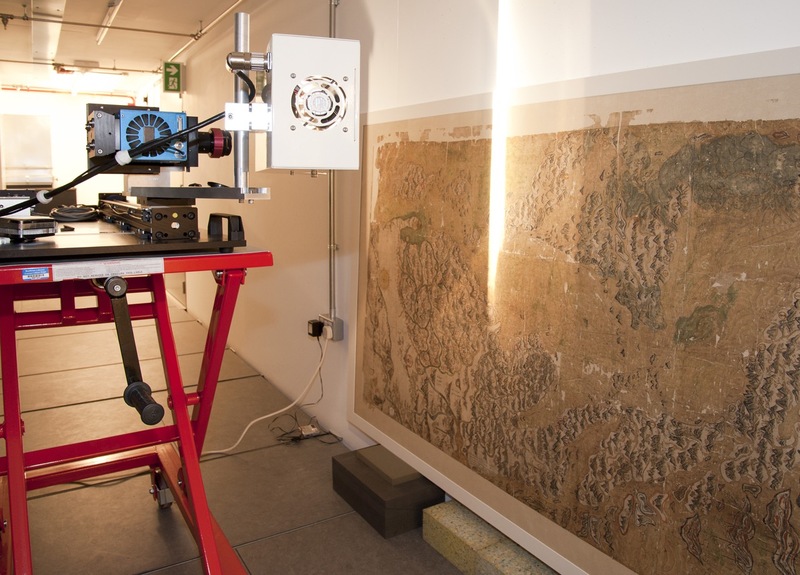 We were carrying out several analyses on the famous early mediaeval Gough map of Great Britain and the equally famous Selden map of China in the newly opened Weston Library, as well as a brief sojourn to Plant Sciences to trial Raman spectroscopy on the glorious Flora Graeca! There was filming and journalists and Professors and conservators………it was like a party! But everyone had a single purpose; to discover more about these iconic objects and everyone worked long and hard hours. I acted as ‘master of Ceremonies’ and now realise the difference between management and leadership! So many people! I was at a talk the other day about bibliographies and one of my curatorial colleagues, who I work with on a daily basis, used language I really didn’t understand and demonstrated both his deep knowledge and my ignorance! And chemists who explain chemistry simply. And managers who can manage! What do you love most about you job? The variety, the people, discovering new things, rediscovering things that haven’t been seen for hundreds of years, giving talks and generally showing off the discoveries, working with wonderful people with wonderful objects. Heritage science is the perfect platform for enjoying cutting edge science in the company of culturally significant ‘things’.